Unlike other popular programs, Omega is built from the ground up specifically for on-demand production with Gerber hardware and materials. We hear a lot that customers don't have anyone in the shop who is an Omega expert -- or worse, they don't have anyone who knows how to use the software at all. We can help! We offer on-site or phone/streaming video training. Use your Gerber Edge FX to its fullest potential! Call for more information: 1-800-232-8018. Omega offers an incredibly deep matrix of material and color settings (called material profiles) that would otherwise have to be created by the user. These profiles are automatically assigned when the user picks the materials and colors appropriate for the job. If you need to match a color, you can punch in a Pantone color and it will tell you what colors to use come closest to matching that color. There is also a printed color swatch book with several thousand color swatches available for a more tangible hands-on color comparison. Omega is intuitive, versatile, and easy to use—a software powerhouse that has the capability to enable a beginner and propel the expert. The advanced production part of the software allows the user to rotate, flip and repeat the image, back or flood coat it with color, reverse the print order, change the heat, resolution, and speed settings. 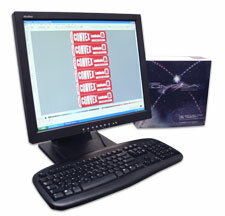 These options allow the user to print just about any kind of label or marking you might need. In addition, it controls the cutter speed, acceleration, cutting force, and cornering. This allows the user to make deep or shallow cuts, back slit, die cut, perforate, etc. In two words... Very Capable.